This is the B page of our A to Z guide to plants -- how to care for them, landscaping with them, and cooking and healing with them. These easy to grow and self seeding annuals are almost a staple in New England summer flower gardens and may often be seen flourishing in wildflower gardens. I have always loved them. Benefits: Aside from its sweet appearance in the garden, the flower petals are edible and easily make a gourmet salad out of one that lacks pizzazz. Photographed: In my garden at Lake Atitlan in Guatemala in 2013. 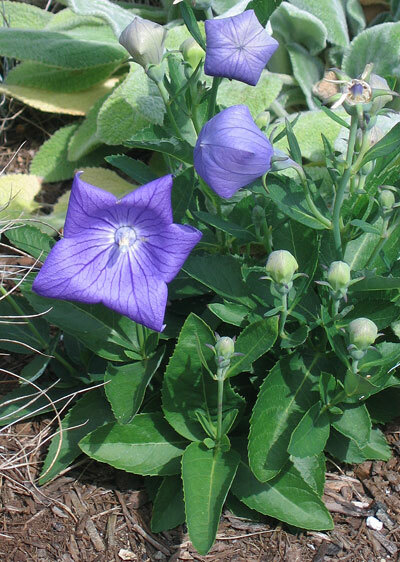 I bought seeds and tried to grow this lovely perennial flowering plant once a year ago with no luck at all. I am trying again this month because they are just so beautiful. I don't think my photographs tell the real story, but so far I have had no luck. To keep these flowers fresh in a vase in the house, sear the stems with a flame as they are harvested. 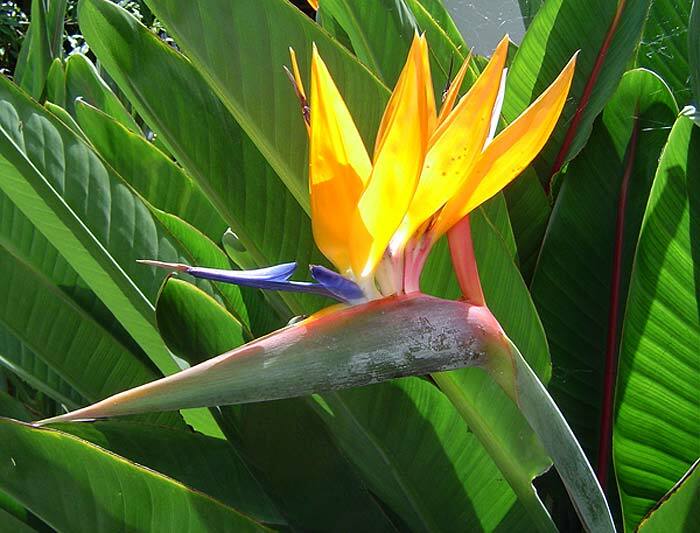 Planting and Care: Plant these little beauties in full sun in more northerly places, but give them a break from the afternoon sun in tropical climates. Routine watering or rainfall will keep them quite happy. 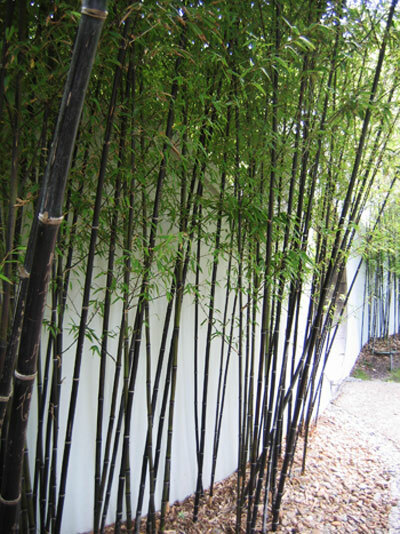 This is a tropical and subtropical clumping bamboo, ideal for some area in most gardens in those climates. I cannot speak highly enough of the clumping bamboo we planted by the very hot driveway in front of our home in Montserrat. The bamboo provided shade and privacy from homes higher on the hill and the sound of it when the wind blew made life a little magical. 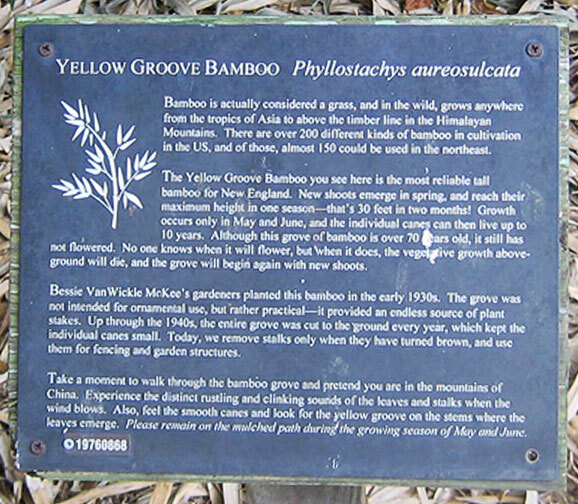 I never did figure out which variety it was, but you can see it below as "bamboo mystery #1." 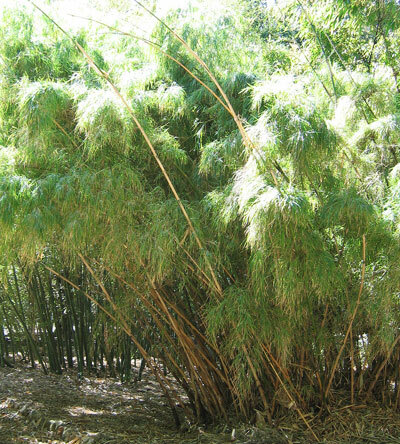 Benefits: This bamboo is used on all sorts of construction project applications, in furniture and in human nutrition as the young shoots are edible. 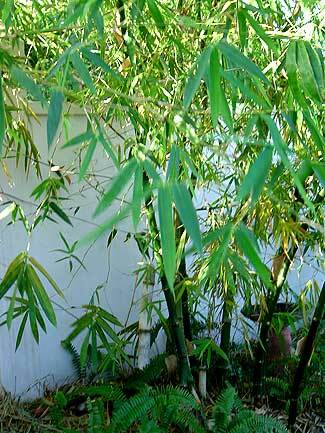 Planting and Care: This wonderful bamboo will grow to be very tall and will have a substantial diameter. 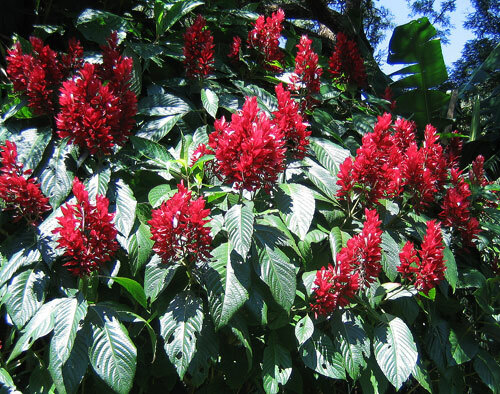 It grows naturally in tropical highlands and hill slopes so it will always prefer full sun and abundant water. This bamboo grove has survived for decades in the frigid Rhode Island winters. 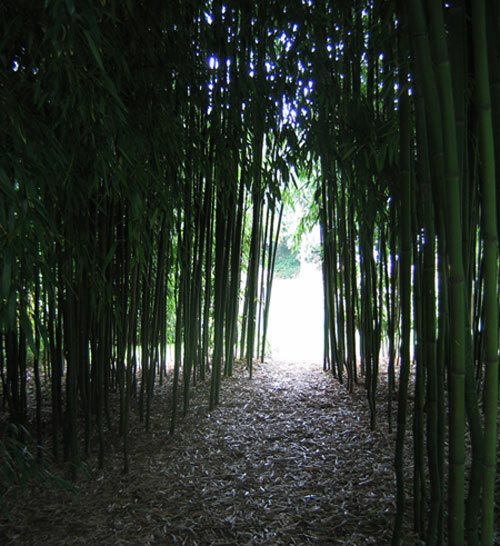 If you have a great deal of land I can think of nothing better than a bamboo grove (well maybe a pine forest). 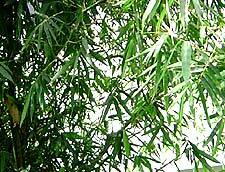 The sound of bamboo leaves in the wind is soothing in a way I can't explain and in hot climates the shade it provides is always welcome. 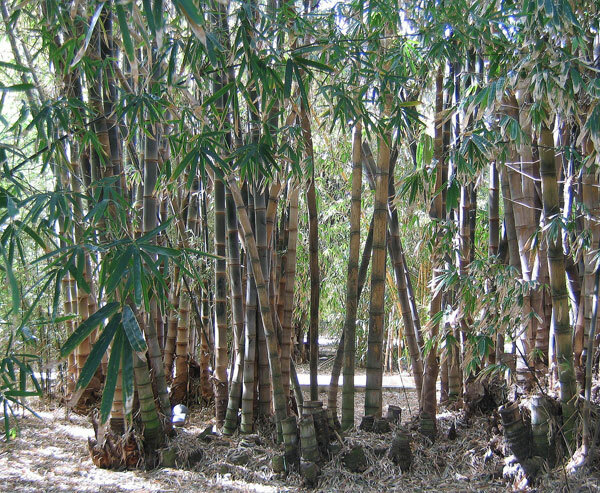 Benefits: Falling leaves from a stand of bamboo make a wonderful mulch and cut bamboo, when dried, makes a fabulously flavorful addition to a charcoal fire for making barbecues. Photographed: In the Blithewold Garden in Bristol, Rhode Island 2013 and 2014. Several years ago we planted clumping bamboo in our shady terraced hill garden, as a sun block for our driveway and as a hedge at one end of our property. We didn't know the variety name at the time and we still don't. 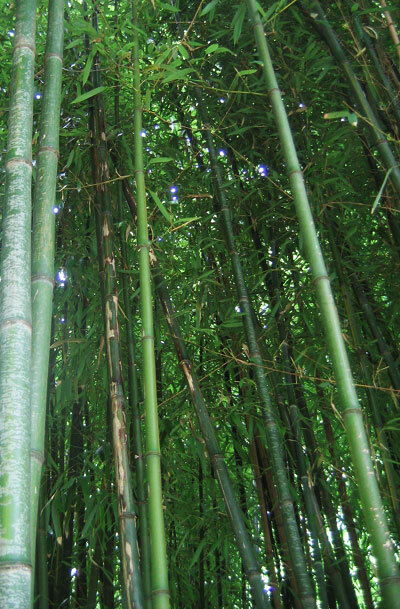 We took culms from a bamboo plant at the Montserrat National Trust that was about 30 feet tall with 3 to 4 inch stems. The Chief Tour Guide and Gardener at The Montserrat National Trust, Pi, told us it was “West Indian bamboo” which doesn't seem to exist on the internet. Maybe with all the marijuana he smoked his imagination had run wild. Our bamboo was a stellar performer! In Montserrat, even the rather conservative folks from Britain and the United States considered it beautiful. Most of them have dreadful tales of running bamboo and all are startled to see that ours is not a monster. We were very careful to choose a clumping variety. 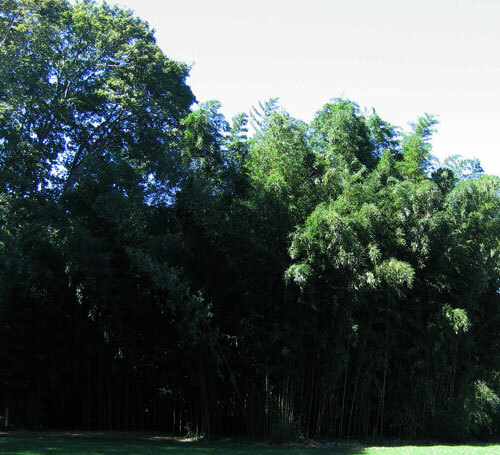 From: I read somewhere that clumping bamboos are native to the high Himalayas which seems very peculiar seeing how happy and healthy ours are at sea level in the tropical Caribbean. 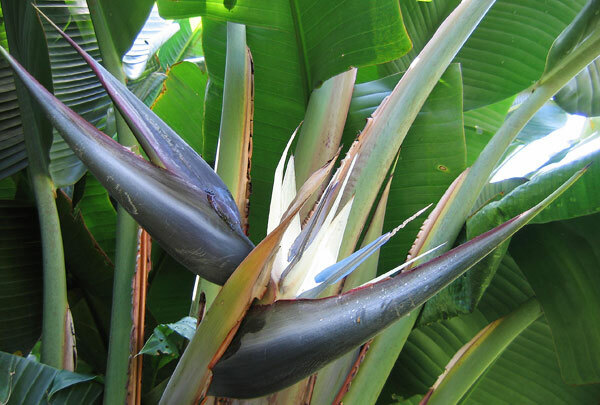 Photographed: In the garden beside our driveway at our former home in Montserrat. Planting and Growth: When you bring home your bamboo shoots set them in the center of an area where they can spread in a natural circle. 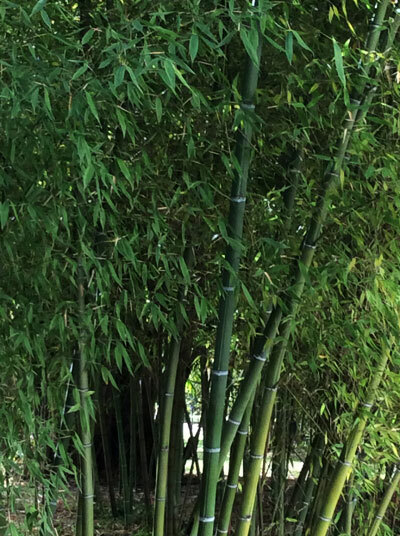 They will prefer a sunny or semi sunny location, fertile soil or the addition of regular fertilizer (bamboo is in the grass family) and routine rain or watering. 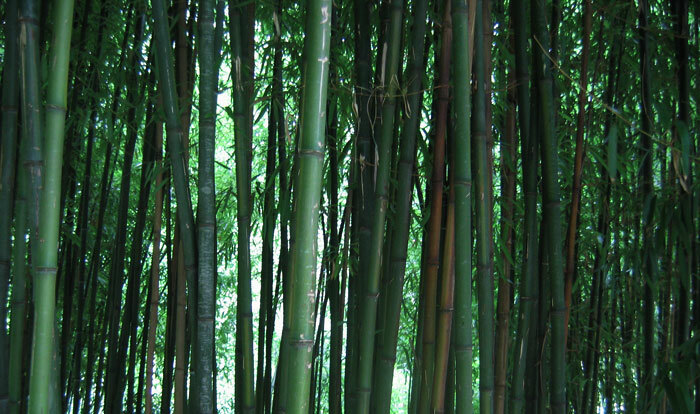 As the bamboo settles in and begins to grow you can determine which of the stalks you will let grow. If one is heading in a direction that you don't what it to grow, simply remove the shoot when it is small. You may also feel free to prune the bamboo a bit if you wish. Photographed: In the Chinese Garden in Sydney, Australia, 2013. 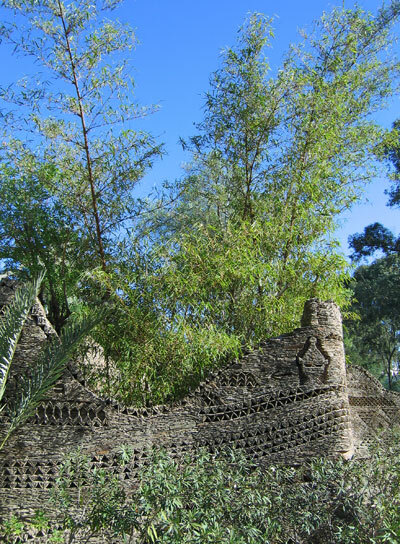 Photographed: In the Jardim de Olhao, in Agadiz, Morocco in 2014. Two of the photographs below were taken on the roadside in a small village outside of Taxco, Mexico. The village, higher up in the mountains and an hour away from Taxco, lies along what was always a difficult road, but is now greatly improved. Here in the village called Tenerillas there is sometimes snow in the winter and year round it is almost always cool and humid because it lies at cloud level. 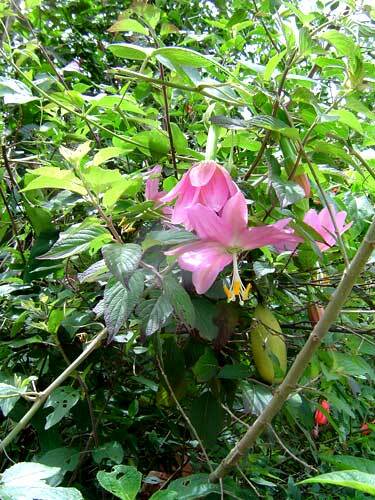 The vegetation in Tenerillas is lush with hardy tropicals as a hard freeze would be extremely rare. Benefits: In Mexico, the fruits of this vine are considered an excellent treatment for high blood pressure aside from their value as a delicious base for a fruit drink. From: One source reported the vine coming from the higher altitudes in Venezuela through to Bolivia and Peru. Another source said Brazil, but didn't mention altitude. Photographed: Along the roadside in Tenerillas, a small village about an hour's drive outside of Taxco, Mexico, in the State of Guerrero. 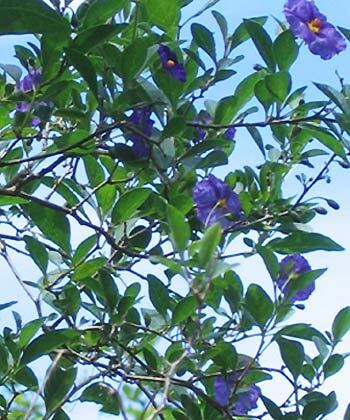 Planting and Care: After stopping to talk with the owner I took some ripening fruit from the vine in Tenerillas, Mexico, whose flowers you see below and brought them to Montserrat in the Caribbean. I kept them refrigerated for several months and finally got them planted. The seeds have proved very hardy as I now have several small plants thriving. I suspect that here in the Caribbean they will prefer a little shade during the hottest time of day. Normally this vine grows best at higher elevations, above 5000 feet. Our former home in Montserrat was just about 800 feet above sea level so we crossed our fingers. We did get two plants to begin growing, but they were weak when we left on holiday and when we returned they had died. If we had been lucky, the mature flowering banana passion fruit vine would have added yet one more hummingbird attractant to the garden and given us its aromatic soft yellow fruits all year round. It is said that in the best setting one of these vines will yield two hundred fruits when it is mature along with a multitude of fabulously beautiful flowers. One day shopping in the market months ago I spotted two banana passion fruits and bought them both. The fruits were ripe so I squished out the seeds and put them in a relatively abrasive small metal strainer. Running water through the strainer I moved the seeds against the strainer to remove the fruit pulp. As an accidental benefit this also abraded the seeds which is recommended before planting. Once in the soil, the seeds sprouted like crazy as you can see below. Photographed: Along the roadside in Tenerillas, a small village about an hour's drive outside of Taxco, in the State of Guerrero, Mexico in 2008. Photographed: On the deck where I plant seeds in my garden at Lake Atitlan in the Guatemalan highlands in 2014. 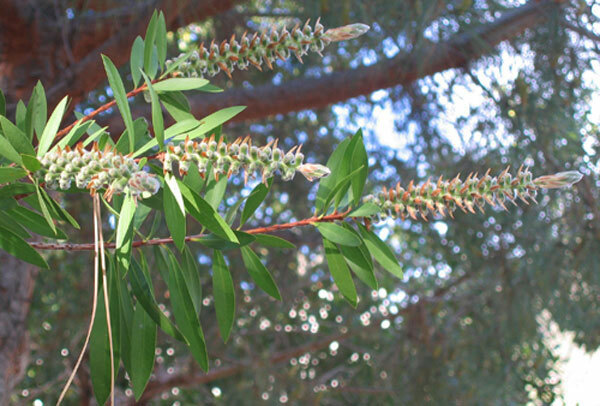 This small tree is appealing for its size, only about 6 feet, its beautiful green leaves and for its peculiar flowering. I'd definitely have one if I were starting a tropical garden from scratch and had lots of land. Photographed: In the Royal Botanical Gardens in Sydney, Australia, 2013. 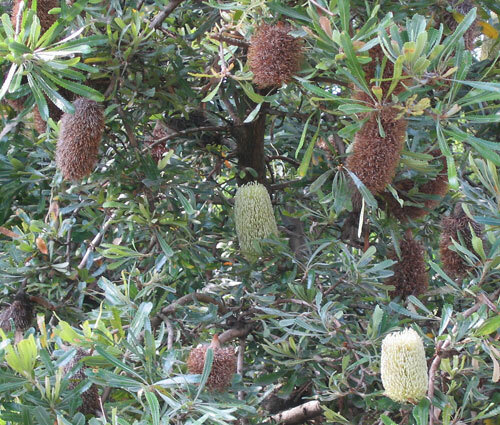 Planting and Care: Banksias grow in hot swampy coastal areas of Australia. 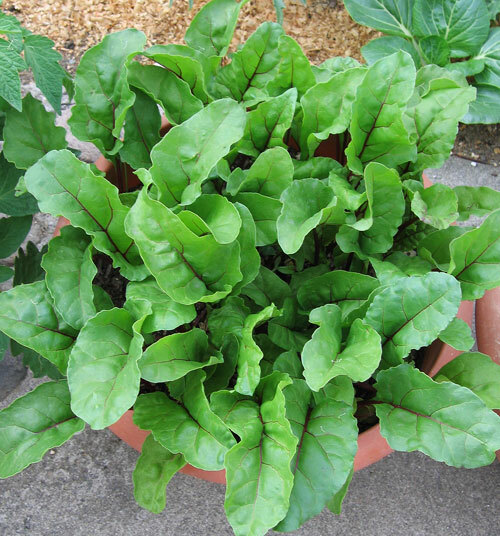 Plant it in full sun and give it a lot of water and it should prove fairly adaptable. I wouldn't recommend challenging it with a frost. 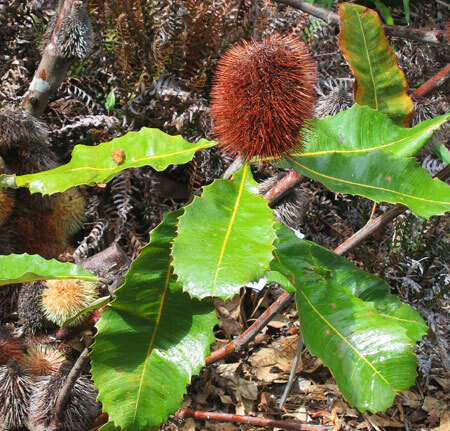 The two types of Banksia in the Royal garden were intriguing and you may find them so as well. 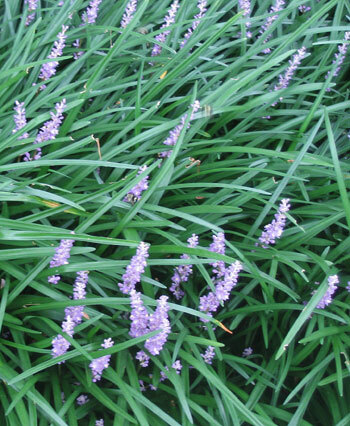 What would a garden be without one or more varieties of this fragrant herb. In Montserrat, we had good luck growing the traditional large leaved soft basil that we harvested regularly to make great quantities of pesto. We froze the pesto in ice cube trays so we had easy serving size portions whenever the mood would strike. Do move your pesto cubes to a sealed container to avoid freezer burn. We also learned to quick saute fresh basil leaves in olive oil to freeze for other uses, like chopped frozen on homemade pizza or chopped into a homemade tomato sauce. Gourmet Magazine also has a great number of recipes for using fresh basil. 1. Once flowering, basil is used throughout Mexico to shoo away flies and it really does work! Pick a few flowering stems and treat them like any other flowers from your garden. Find a pretty vase, fill it with fresh water and load it up with basil. 2. Basil may also be a healthful energizer. Try making a light tea from several leaves and see how you feel. 3. Basil may also have a beneficial affect on high blood pressure. Planting and Care: In the Caribbean and in other very warm climates, this large leaved soft type of basil seems to prefer some shade during the hotter parts of the day. Plant it in rich soil where it will receive morning sun and regular rainfall or routine watering. 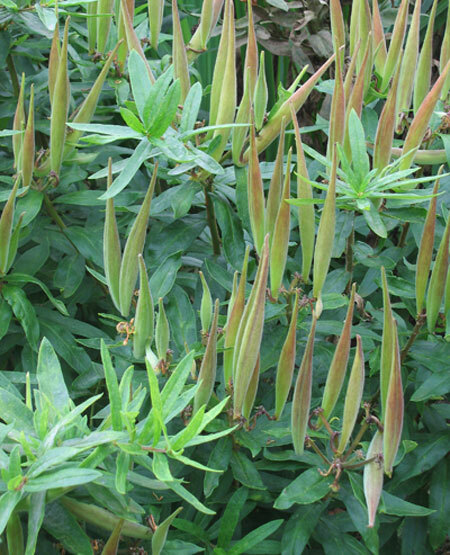 When the plants reach about eight to ten inches tall, begin to harvest the upper leaves. Take a sharp knife and cut just above a leaf joint. If you don't harvest the leaves regularly, the plants will begin to flower and the leaves will grow smaller and a little bitter. When this happens the plants are no longer useful in food preparations, but will work fine as insect repellents. When your basil has been in the ground for a couple of months and seems to be growing woody, harvest several soft (not woody) stems with a few leaves. Place these in water in a bright, but not sunny, window. They will quickly root and you will have fresh basil to plant. You can do this for several months, but at some point you will have to start over from seeds so when one of your plants goes to flower leave it until it begins to seed. Then pull it up gently on a wind free day. Shake the dry plant over an old sheet and collect the seeds for the next gardening season. Let them dry for a day or two then put them in a small plastic bag and keep them in the refrigerator until you are ready to plant them. 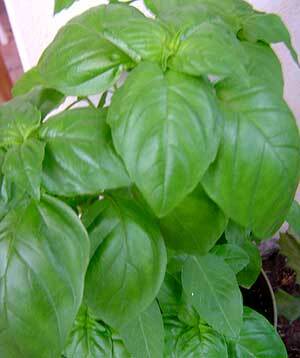 From: Basil is said to have originated in such diverse continents as Africa and India/Asia. Photographed: In the herb garden at our former home in Montserrat. 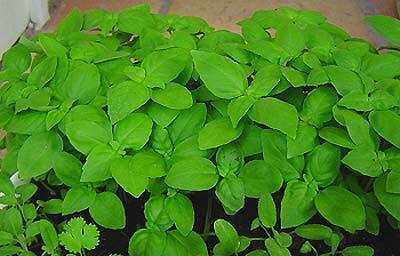 Varieties: The basil you see pictured above and to the right is probably Large leaf or Lettuce Leaf. These plants were able to grow well in what can be a hot, dry and VERY windy climate that just as easily in a few days can be a very rainy temperate climate. The leaves seem incredibly soft and hence the name. We have now planted Large Leaf at our new home at Lake Atitlan and it has produced wonderfully. 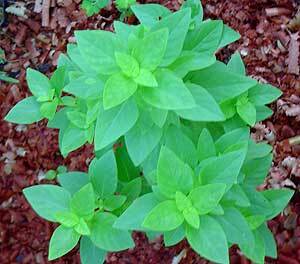 **Basil (2), Mint (in Montserrat) Caribbean Perennial Ocimum basilicum (L.) Willd. 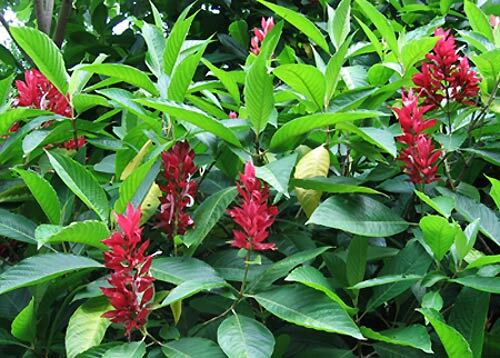 This plant has small leaves, less than an inch long, a terrific flavor and, best of all, it is a very tough plant that can grow in tropical sun. 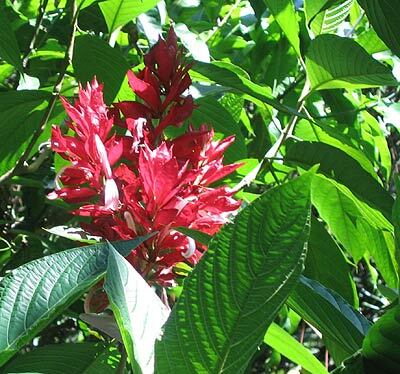 Benefits: In Montserrat and probably in much of the Caribbean it is used as a tea. Planting and Care: This plant will root easily from a six inch cutting placed in a glass of water on a bright, not sunny, windowsill. Once rooted it can be moved outside, first to a semi shady area in a small pot and then to a bright sunny spot in the garden. It is a lovely plant and will grow to be about two feet tall before it always seems to succumb to some insect, most often mealy bugs. So, although it is a perennial we keep individual plants only about a year before renewing them with a fresh cutting. This variety of bay leaf is grown primarily in Turkey and is almost always used dried. 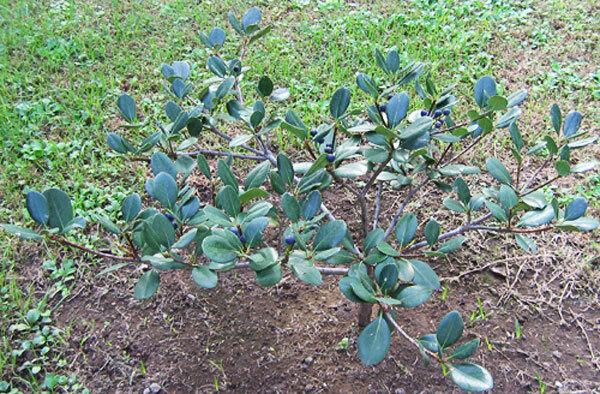 The other variety of bay leaf tree, Umbellularia californica, grows primarily on the west coast of the US and in Mexico where it is the only variety of bay leaf readily available. The two types of bay have very different flavors. I was never able to adapt to the Mexican variety and usually just left it out of any recipe I was making. Benefits: Bay leaves have been used to repel insects. The bay rum tree is very attractive and can be grown on a relatively small plot of land as a garden centerpiece. 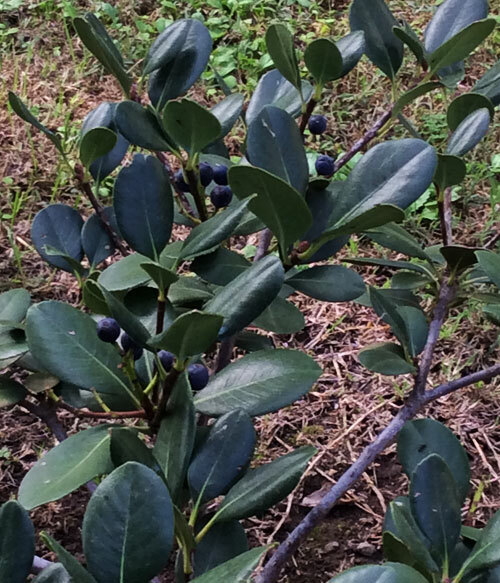 Its leaves are dark green and shiny resembling the shape of the bay leaves used in cooking, but BEWARE bay rum oil is toxic so the leaves are probably toxic too. Its flowers are not memorable for their beauty, but they provide a lovely enduring scent in the garden. 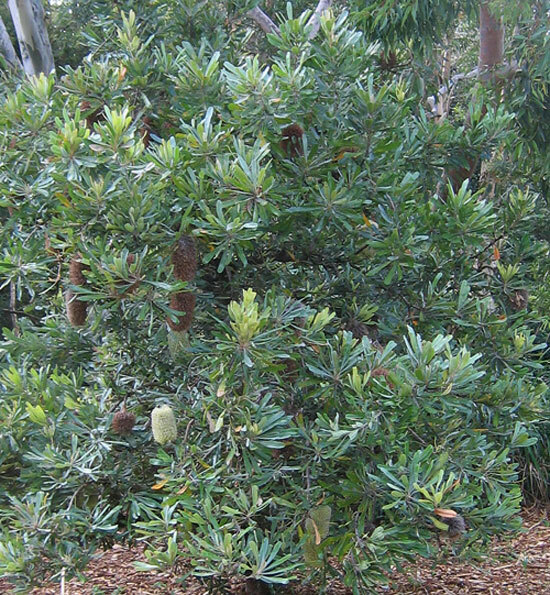 Benefits: Growing to up to 40 feet tall this tree is the source of bay oil used in making the popular bay rum cosmetic products that are said to have originated in Montserrat. 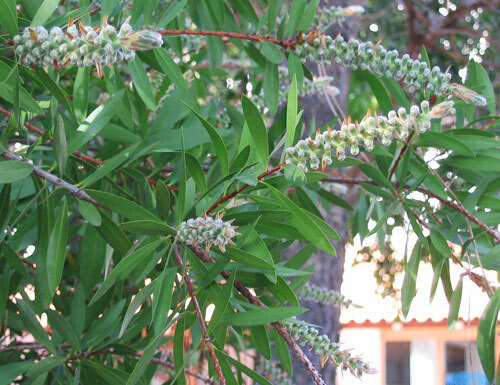 One hundred pounds of bay rum leaves yields one pound of an essential oil called myrcia. 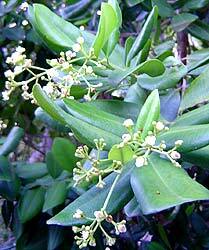 Bay rum is made from a combination of bay oil or myrcia, orange oil, pimenta oil, alcohol and water. Parts of the bay rum tree have also been said to have curative powers in external applications for muscle and joint strains and pains. Planting and Care: Trees live so long and are large enough to dominate areas of your garden so choose well where you will plant this one. It prefers full sun and routine rainfall or watering though ours which are fully grown have suffered through several droughts with little apparent damage. 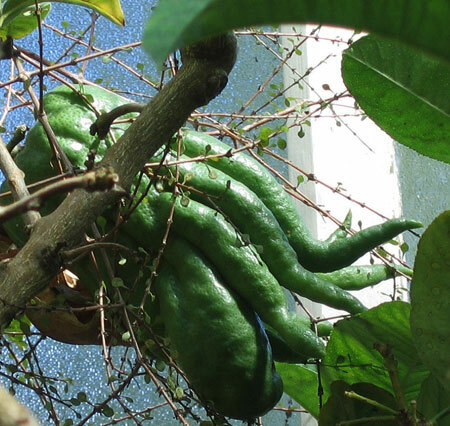 This is a prolific climbing type of green bean which as the name implies is very long, not a yard, but at least a foot. We planted these beans along with Italian pole beans. The local large rodent called an agouti ate all of the latter so we are very fond of the asparagus bean for its survival characteristics. Even though the plants look terrible they produce enough beans every day or so to make the evening meal green and they are delicious. Planting and Care: Plant a few seeds by a 10 foot pole in full sun. With regular rainfall or watering you should begin harvesting in about sixty days. The seeds for this type of bean can be identified because they are a muted red in color. Benefits and Cures: I lived in Oaxaca for two years where my diet consisted almost entirely of black beans, onions, green peppers, jalapenos, tomatoes, huge hand made blue corn tortillas called tlayudas and menonita, a type of cheddar cheese made in Mexico by a community of Mennonites. I have never in my life been healthier or had an easier time controlling weight. I just never even thought about it. Yahoo News had this to say about the health benefits of black beans, "... 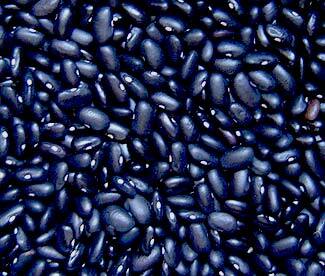 Basic black is always in style; the darker a bean's coat, the higher its antioxidant activity. Beans are so good for you, they straddle two slots on the food pyramid. "They have enough protein to be a meat, and the vitamins and fiber of a veggie," says Christine Gerbstadt, M.D., spokeswoman in Sarasota, Florida, for the American Dietetic Association (ADA). One cup packs half your daily folate, blood pressure, regulating magnesium and energizing iron." I disagree firmly when she went on to say that you can get the same benefits from a can of black beans. Shame on you Christine. 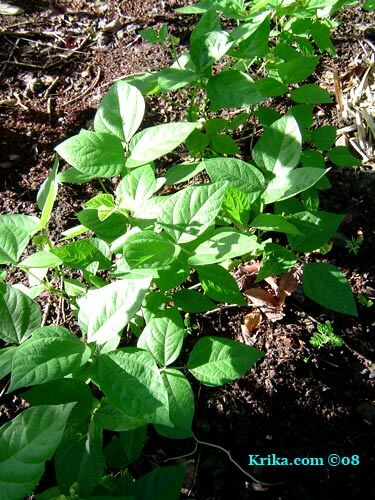 Planting and Care: Black beans are hearty plants that look like all the other beans you might grow. They are not climbers and will need to be left idle in the garden at the end of the season so that they may dry properly. Unless you have some serious acreage, I don't recommend trying to grow the pounds or kilos of these beans that an average family might like to have. Photographed: In the market in Oaxaca, Mexico. Wash the beans in clean water and prepare the vegetables. Get a large pan, maybe about 8 quarts in size. Fill the pan about half way full with clean water and bring it to a boil. Add the prepared vegetables and beans, cover and bring it back to a boil. Lower the heat to low and let the beans cook, checking them maybe once an hour. After two to three hours, depending on their freshness the beans will be getting softer. Now you will need to pay a little attention. Take the top off and adjust the heat so the bean mixture is just simmering. You are now trying to dry the mixture as much as possible without letting it burn. As it thickens you will need to give it more frequent stirrings. When you are bored with all of this, STOP. Let the beans cool and then take out your Cuisanart. If you don't have one, beg, borrow or steal one as it really is the best tool for the job. Puree amounts of the beans that fit comfortably in the size of Cuisanart you have and continue until you've done them all. Freeze the beans in amounts that you will comfortably use in a day or two. Served with Flame Toasted Fresh Hand Made Blue Corn Tortillas. This is a delicious bean that I always thought was a primitive lima bean. Whether it is or not cooked in a stew it makes winter nights quite alright. Don't forget the beans fresh from their pods have to be individually peeled as they are in France, Mexico and Guatemala. Not an enjoyable part of favas, but well worth the effort. I recently read that when favas are very young you don't have to peel them, but I have little faith that is true. Planting and Care: This is a cool weather crop so it is perfect for a Guatemalan winter (November through February). Despite its preference for cool weather it does like to be living in full sun. Planting and Care: Work over your soil well incorporating a bit of lime and as much organic material as you can spare. Plant your seeds about one inch deep and one inch apart. In Montserrat we tended to plant them in November for an early February harvest because insects were not so prevalent in that season and the heat never became a deterrent to success. I would have to say the same thing about kidney beans as I did about black beans. If you don't have a lot of fertile acreage, you are going to have to find a commercial source for the kidney beans a normal family might eat in a year. In the Caribbean wonderfully fresh dried kidney beans are readily available. Here in Latin America there is a bean called, riñones or kidney, but it just isn't the same. In Mexico we used a bean called flor de mayo which was a great substitute for kidney beans. The mung bean is what we know as the most common "bean sprout" in most of the world. These are the wonderful crisply fried sprouts so essential in Chinese cuisine. Like us, many people wrongly think that sprouted soy beans produce the Chinese dishes. Mung beans are as easy to sprout as alfalfa and about one tablespoon of seeds produces about one quart of sprouts. When the sprouts are fully developed give them a rinse and a drain and store them in the refrigerator. They will keep for several days. Benefits: The beans themselves are high in protein, about 25% by weight. They are also said to have detoxifying properties. Try cooking them with coriander, cumin and ginger. If you sprout the beans you will be getting vitamin C that not in the beans themselves. And, mung bean flour is said to be useful in caring for the skin. Planting and Care: Plant your seeds about 1" deep and be prepared to wait because these beans take more than three months to reach their height of from two to three feet, to flower and produce mature bean pods. When they do produce, you won't be disappointed as each pod will contain about 10 to 15 seeds. 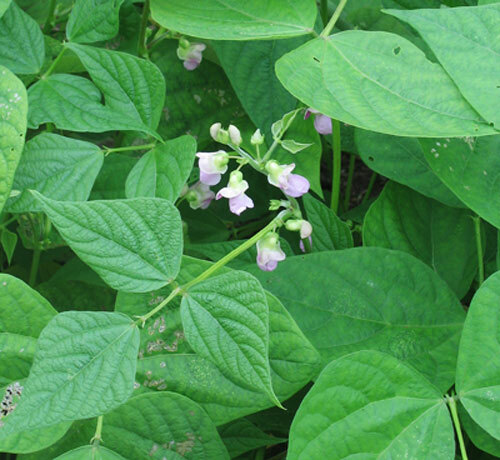 Mung beans make a good green manure crop and are nitrogen fixing. They are also both heat and drought tolerant and so make one a good choice for growing in a tropical summer which is a very difficult time for most vegetables and other plants. I recently saw an article on curative foods on Yahoo and was surprised to see "pork and beans" right there with yogurt. Personally, I think my home made Boston Baked Beans are right up there with any heavenly food you might make and with all natural ingredients, they are extraordinarily healthy to eat (except that they are fattening). Benefits: Aside from being a good source of potassium, white beans provide fiber, protein and iron. Photographed: Growing wild by the side of the road in Sicily, Italy in 2012. This is a plant we first saw in the Botanical Gardens in Athens. Aside from lovely winding paths and many large trees providing wonderful shade this garden is disappointing. The Bear's Breach is the only memorable plant we saw. And that's okay, because it was love at first sight and I finally have two thriving plants right outside in my garden. They have been blooming for months. 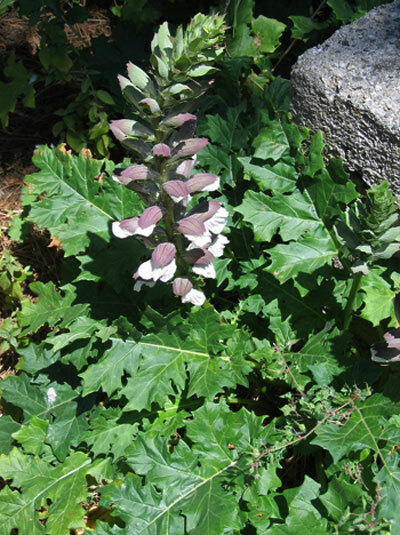 Planting and Care: Grow bear's breach in bright semi shade with regular rainfall or watering for best results. 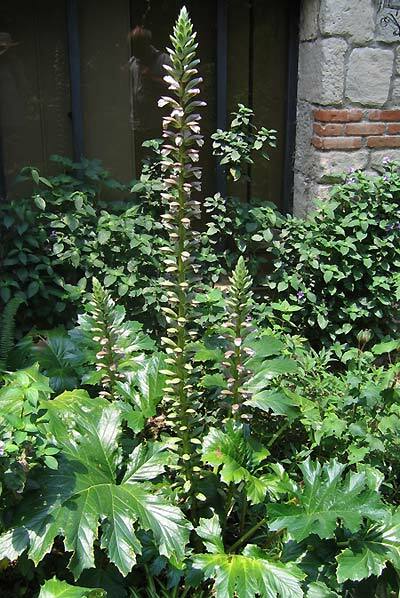 The leaves and tall flower stalks, up to five feet, make this a stunning accent plant. 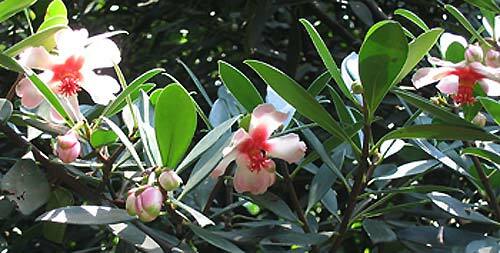 Photographed: At the Botanical Garden in Naples, Italy in 2012. 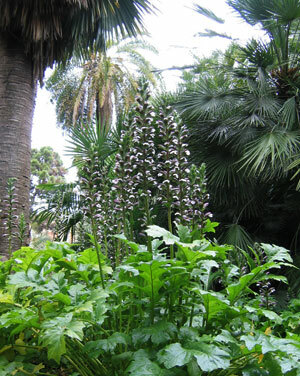 Photographed: In the Botanical Garden in Palermo, Sicily, in Italy in 2012. 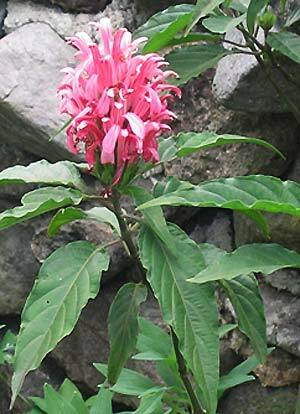 Photographed: In the Botanical Garden at Hotel Atitlan on Lake Atitlan in Guatemala in 2010. Photographed: At the Botanical Garden in Naples, Italy in 2014. 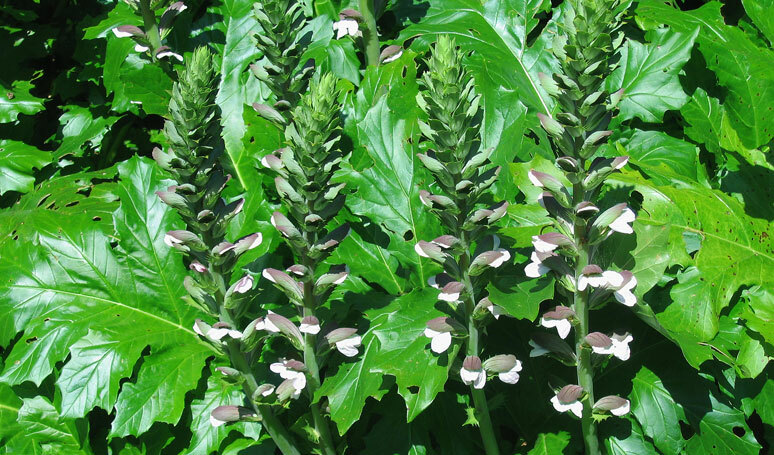 This is a striking perennial growing to be about five feet tall. 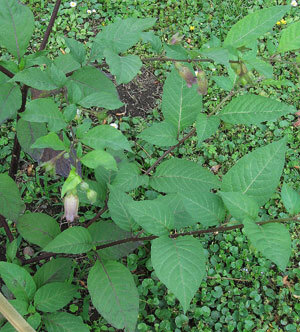 Benefits: Native American Indians used beebalm for its antiseptic qualities. From: The United States, from Maine following the coast south as far as Georgia. 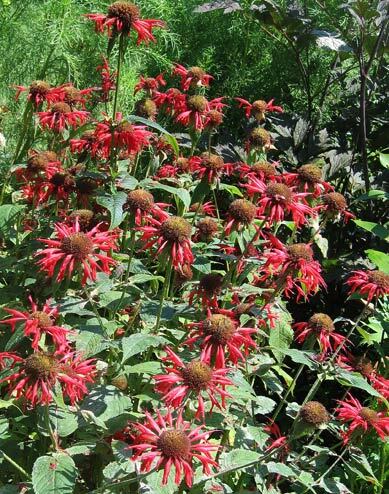 Planting and Care: Beebalm prefers to be planted in full sun, but it will tolerate some shade. Water it regularly unless you have frequent rainfall. All too often beets are overcooked and fall into the same group of inedible vegetables as overcooked cabbage and broccoli. When well prepared, beets are delicious! In New England they grew like weeds, but in the Caribbean we never saw even one appear in the garden despite out best efforts. I tried again in our new garden in Guatemala and had great success growing them in large pots. 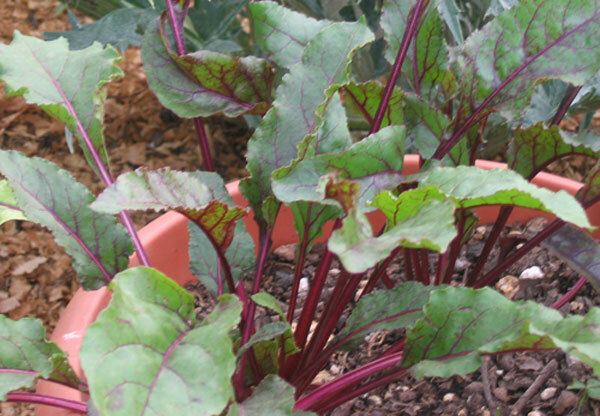 Benefits: The lowly beet was the staple food of many peoples, both in its vegetable form and as a source of sugar. Beets are said to be very good for you, especially for your skin, but I simply can't demystify the chemical lingo. What I do know is that they are a good source of vitamins A, B2, B6 and C. Eat them if you like them and you'll reap untold benefits! Photographed: In our garden at Lake Atitlan in Guatemala in 2014 and 2015. Planting and Care: I believe it is normal to soak the seeds overnight to give them a leg up on germination. I forgot to do that with the beet seeds I had, but it didn't seem to matter greatly. Plant them in a container that will receive strong morning light, but avoid the mid day sun. Gradually begin moving them into full sun. 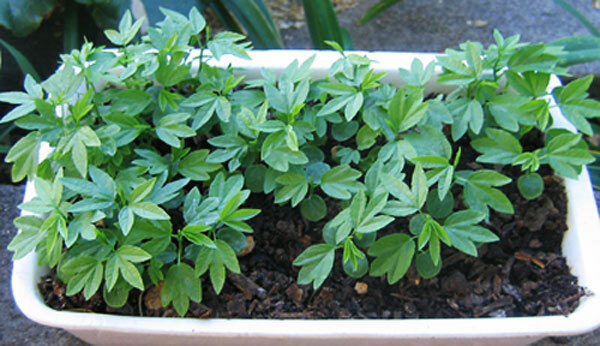 When they are small with a few leaves transplant them to large pots or directly into the garden . In the pots you can crowd them a bit, but in the garden leave about 4 inches between plants. They will do best with full sun in a compost rich soil. Harvest your beets when they are about 2.5" in diameter. Leave about 4" of stem on the beets when you cook them so all the color doesn't drain out into the water. As for varieties, I tend to stick with an old favorite called "Detroit Dark Red." GMO ALERT: I suspect that beets now grown in Mexico and Guatemala are genetically modified. I love beets, but after cooking them for more than an hour while living in Mexico, I eventually gave up as we did with potatoes. There just seemed to be something very wrong. Living now in Guatemala I have found the same problem so I no longer buy beets. Sugar producing beets are all pretty much GMO so read the label on your bag of sugar to be sure it is pure cane sugar. Belladonna, Purple Nightshade Atropa Belladonna L.
The entire plant is toxic. I found this on the web some time ago and I don't remember where, but I think it is important to include here. "Don't mess with this one—pop a handful of berries in your mouth, and you'll physically be unable to call for help. After you lose your voice, respiratory complications, intense digestive disruption, and violent convulsions begin, the combination of which has proven fatal." 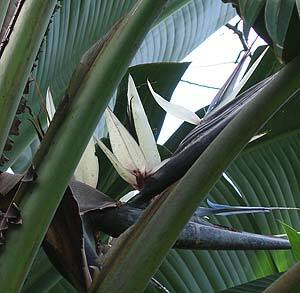 Photographed: In the healing plant garden at the Naples, Italy, Botanical Garden. 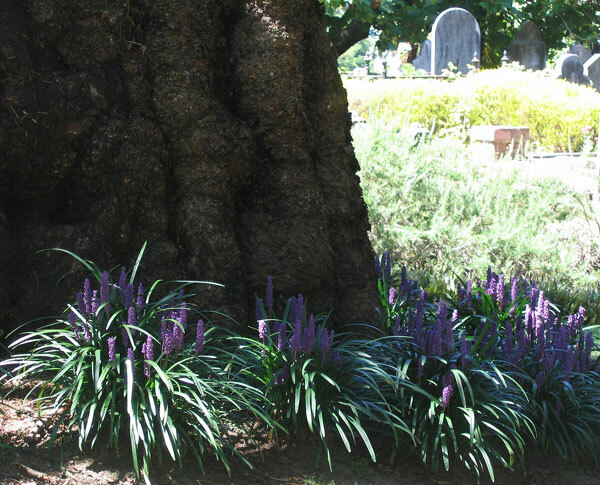 Planting and Care: Belladonna likes to be planted in the shade in a sweet soil in a garden spot that is usually moist. I found the poppy like quality of this flower especially appealing. It is low growing and seems almost a wildflower. This very appealing tree will grow to a modest 15 feet in height, though it will be pretty wide at about 9 feet. From: Western Pacific ocean areas. 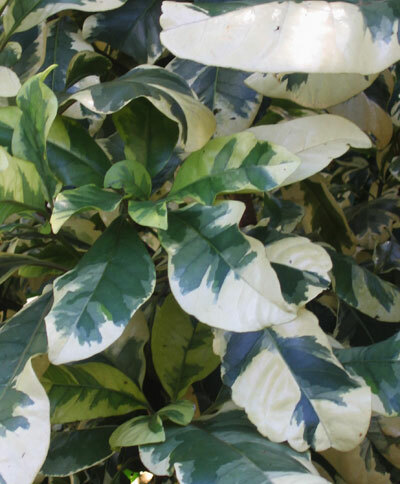 Planting and Care: This is a warm climate small tree that prefers full sun but will tolerate bright shade. Plant it in well drained, but moist humusy soil. It will require routine rainfall or watering. 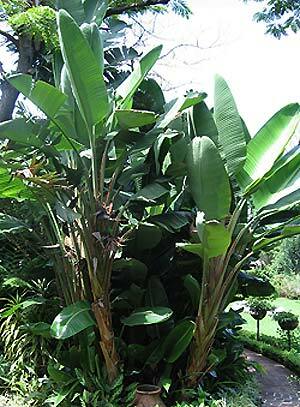 This is one of the plants I always coveted, but did not have growing in our large garden in Montserrat. It just wasn't available on the island. 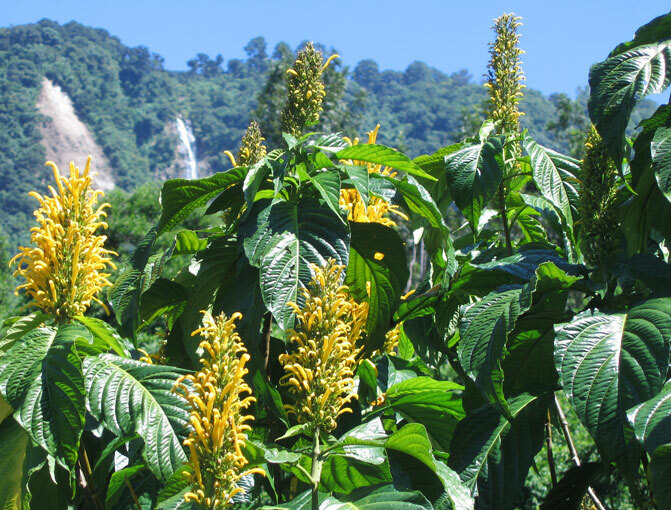 Now that I have one in our garden in Guatemala, I knew just where to plant it so that its exotic flowers and very large leaves will be at their best in the four foot height they usually achieve. 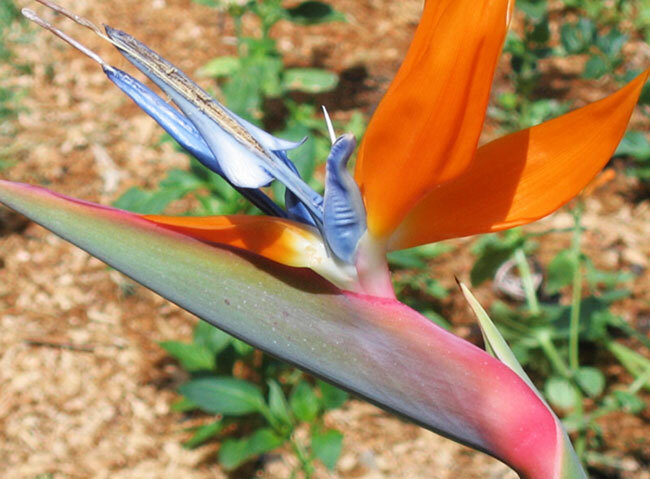 Planting and Care: This stunning plant likes to live in the sun with its feet firmly planted in rich soil in a setting that receives regular rainfall or watering. 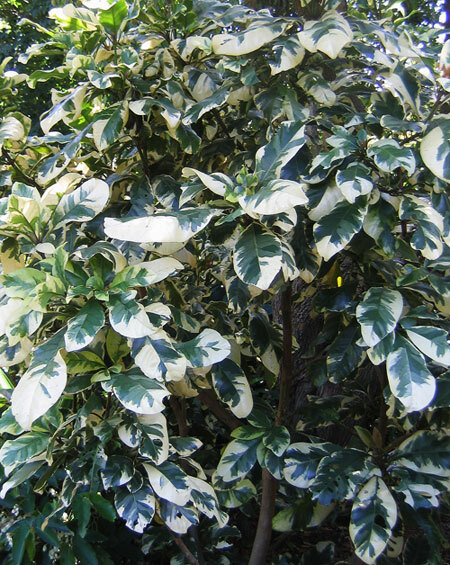 It will do well also in semi shade, but reduce its exposure to watering or rainfall as well as to the sun. Once it is fully established it will become quite hardy, surviving drier periods pretty well. 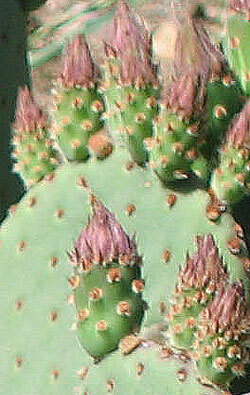 Photographed: In our apartment garden in Oaxaca, Mexico, in February 2010. Photographed: In our garden at Lake Atitlan in Guatemala, 2013. Photographed: In our garden at Lake Atitlan in Guatemala, 2015. 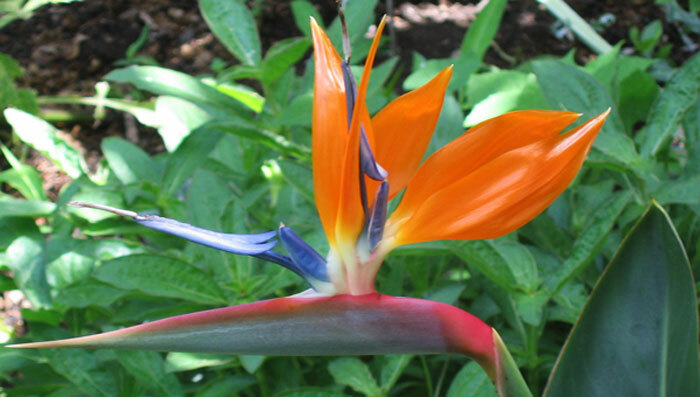 As you can see in the photograph to the left, this is a HUGE member of the Bird of Paradise family. These plants were more than feet tall and I casually mistook them for some variety of bananas until my husband called my attention to them -- truly extraordinary. Note: Physical contact with this plant may produce allergic responses in humans and animals so it is best to wear gloves when trimming or otherwise working with it. Photographed: At the Hotel Atitlan on Lake Atitlan in Guatemala, 2010. Planting and Care: Full sun is optimal, but bright semi shade will also be fine. Also see above. This shrub reminded me of several large pride of Barbados shrubs we had in our garden in Montserrat and I felt more friendly toward it than I might have otherwise. It isn't as showy as the Pride of Barbados though its more delicate appearance may appeal to some. 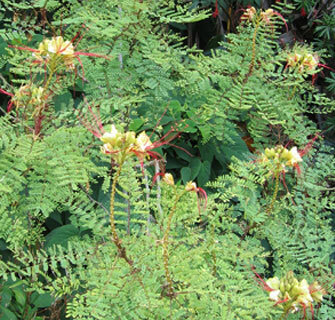 Benefits: Parts of the caesalpinia gilliesii have been used in a variety of ways in herbal medicine, but the green seed pods and the seeds are toxic. Planting and Care: The Caesalpinia gilliesii is a tropical plant adapted to dry conditions. It will grow to be about twelve feet tall given enough water, but less tall with less water. We were given thinnings of this plant from a neighbors garden, but told nothing about what it was or where and how it preferred to live in the garden. Okay, good practice; it's an orphan so put it first in semi shade with regular, but not too much water. The roots soon put up leaves and I thought for sure we had a new type of iris in the garden. I was very happy. We waited and waited and after several months stems appeared and grew a good four feet before blooming with lovely orange speckled flowers that last long enough to make the whole exercise well worth the effort. 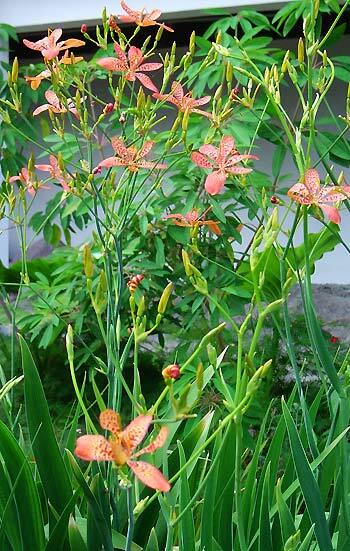 Planting and Care: Leopard lilys look almost like irises and most of the year you'll have an ever enlarging clump of tall thin medium green leaves so it makes an excellent background plant for flowers growing only to a foot or so. I wouldn't even dream of growing these from seed, but if you come by some small plants put them in full sun or semi shade with regular water or on the dry side and they'll do just fine. 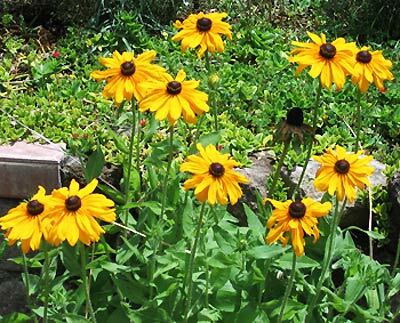 Black-Eyed Susan, Coneflower Rudbeckia sp. These lovelies will grow usually to be about 2 to 3 feet tall and will bloom frequently all season up north and nearly forever in warm climates. 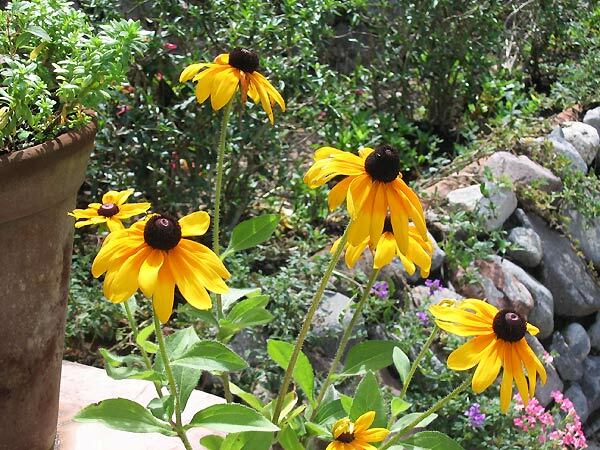 Planting and Care: Black eyed Susans may be treated pretty much as weeds once they settle in to their sunny spot in the garden. Before that make sure they are receiving routine watering. This plant grows well despite its delicate appearance. 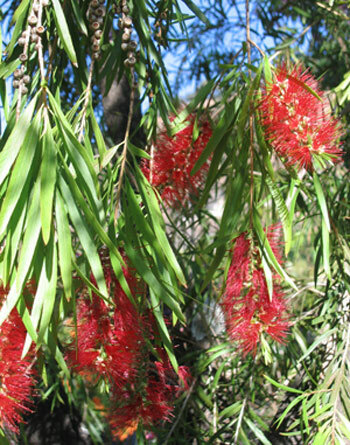 Unlike its Caribbean cousin, it has no vine like quality and it blooms for an all too short period once each year. It is one of my personal favorites. I remember with great fondness many summer days when my mother would take us out into the woods each of us carrying a little bucket with the obligation of it being filled at the end of the day. The buckets were always filled with blueberries as we well knew Mom's pies. These little teeth staining beauties make muffins and pies to die for. Always look for the little ones as those are less farmed and so less likely to be chemically damaged. Benefits: This is the small plant providing you with the berries that will "save your life." I ate a lot of them when I was a kid so I guess I'm guaranteed longevity. I only wish I believed the food industry PR hype. I hope you don't either. Planting and Care: To entertain yourself you might want one of these in your garden. If so, blueberries need an acid soil that is well composted, moist and well drained. As for sunlight remember they hail from New England which has a pretty mild summer sun. Adjust your planting site accordingly remembering that morning sun is more gentle than that in the afternoon. Appearances can be deceiving and this is a very good example, because blue ginger isn't in the ginger family at all even though it sure does look like it should be. At its best it will be up to 8 feet tall and about a yard wide. 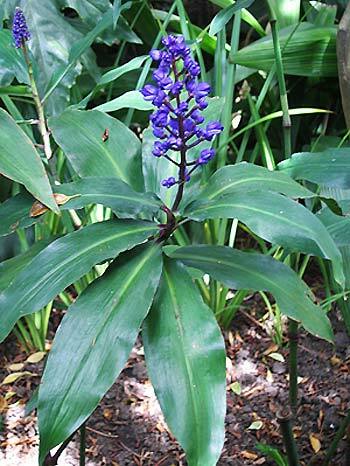 Planting and Care: Blue Ginger likes a semi shady or sunny place in the garden and routine rainfall or watering. Photographed: On the left and below at the Royal Botanical Garden in Sydney, Australia and on the right at the Hotel Atitlan botanical garden on Lake Atitlan in Guatemala. From: The Himalayas, India and China. 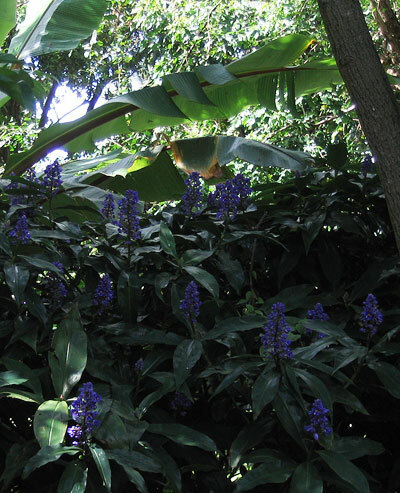 Planting and Care: This lovely tropical climate shrub will grow to be about 4 to six feet tall and miraculously it prefers to be in a semi shady place in the garden. It also seems to prefer slightly acidic soil. 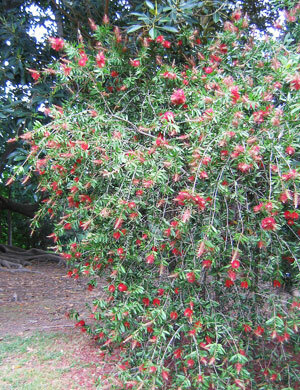 My #8 Shrub Mystery was solved by Glenn a visitor to my website who lives in Brisbane, Australia. Many thanks for your help. 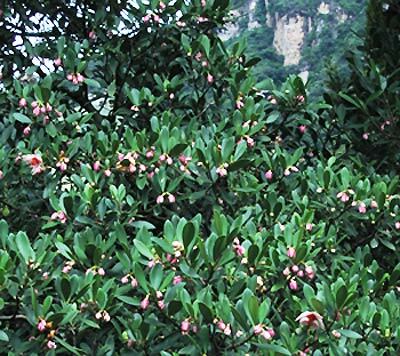 This pretty shrub might also be called a small tree as it grows ideally to a height of up to 10 feet. It is almost always covered in lovely small perfectly blue flowers with a heart of yellow. 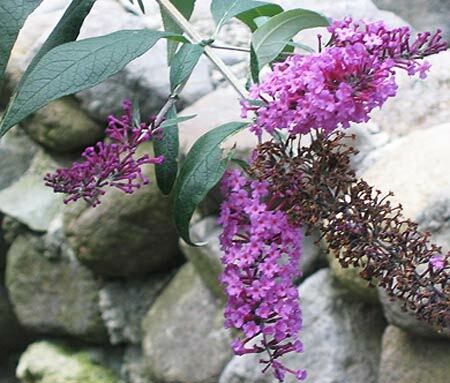 Planting and Care: Plant this shrub in full sun in a drier part of your property. It is fast growing and will tolerate the high temperatures and dry periods of the tropical and subtropical environments very well. Give it a pruning after a main blossom period and it will keep a nice shape and give you even more flowers. This little beauty is a perennial reaching a height of under two feet and it's covered in lovely flowers from spring through summer. What could be better? Benefits and Drawbacks: Well nothing so pretty is without its downside. Isotoma axillaris is poisonous if you eat it and may be irritating to your skin as well. Wear gloves. Photographed: Somewhere on the road in Rhode Island in 2013. My #1 flower mystery was generously solved by the Cowells Garden Centre in Newcastle Upon Tyne in Great Britain. 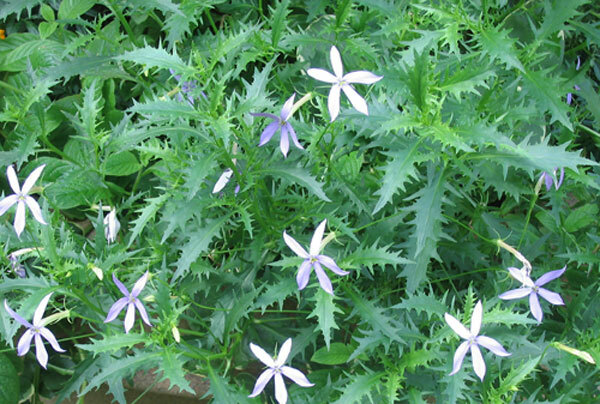 This is a low growing spreading ground cover plant with leaves that are green on top and purple underneath. I believe that what you are seeing below to the right are old varieties -- maybe interesting, but not spectacular. On the left and in the large photo below you'll see the improvements that have been made over the years. 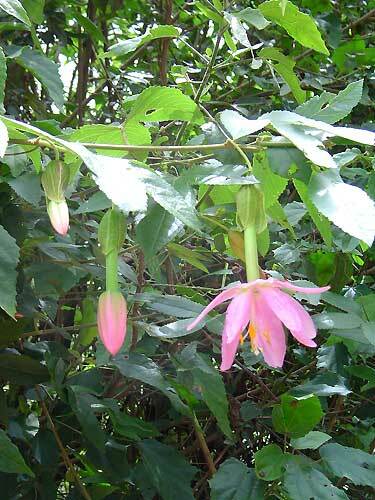 Note: The sap from this plant is said to be a skin irritant, though I have not found it to be so myself. Photographed: The old variety in our shady terrace garden at our former home in Montserrat and the newer varieties in the Royal Botanical Garden in Sydney, Australia. 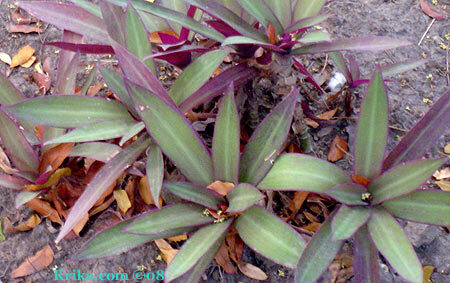 Planting and Growth: This plant seems to be in the wandering Jew family. It is hardy, surviving drought or lots of rain, direct sun or deep shade and all with absolutely no care other than what Mother Nature delivers. As with all of us though, it does look better if given a little care. Benefit: This is a hummingbird attractant. Planting and Care: This sprightly ground cover will do best in a semi shady garden area that receives lots of rainfall or routine watering. Planted in a sunnier location seems to bring out more flowers, but they are smaller and less appealing. 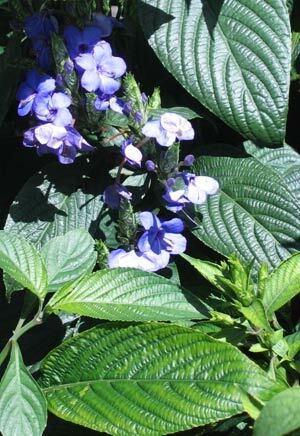 Photographed: In our driveway border garden at our former home in Montserrat, 2008. This is a grass-like border plant with a peculiar ability to adapt to and change its form depending on the level of light it receives. 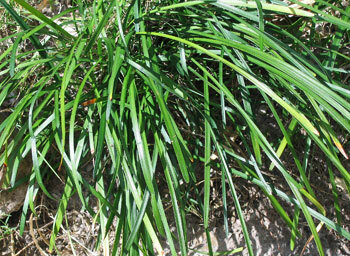 In the shade where ours lived for three years in Montserrat, the leaves were thin, deep green and about 10" long. Someone told me that border grass would be happier in the sun so I moved them to our driveway garden, using them as a border for our amaryllis. At first they suffered terribly, looking on the verge of extinction. 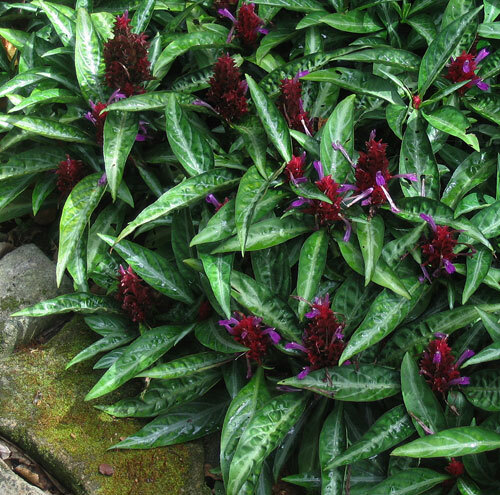 I was about to move them once more, when they began to grow shorter, wider with less deep green leaves and, in the spring in a tropical environment, to flower with spikes of tiny purple blossoms. In a New England garden they look overall much happier even if it is only for five months or so. Planting and Care: Border grass is one of those peculiar survivors which will adapt itself to full sun, semi shade or full shade and a likewise variable amount of water. 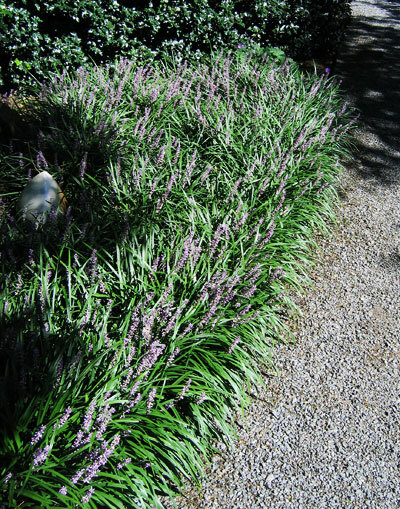 With a little care when first planted, border grass will also provide you with a very attractive and tough plant to stabilize soil loss on slopes and it has the added advantage of pretty purple flowers. 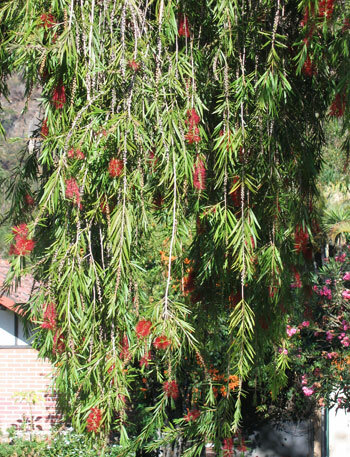 These are pretty little trees with a variety of red flowers that look much like powder puffs. 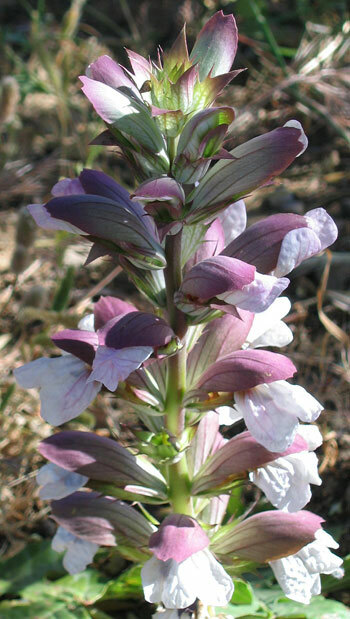 They are as a whole very appealing and small enough to be accommodated in almost any garden when planted in full sun. 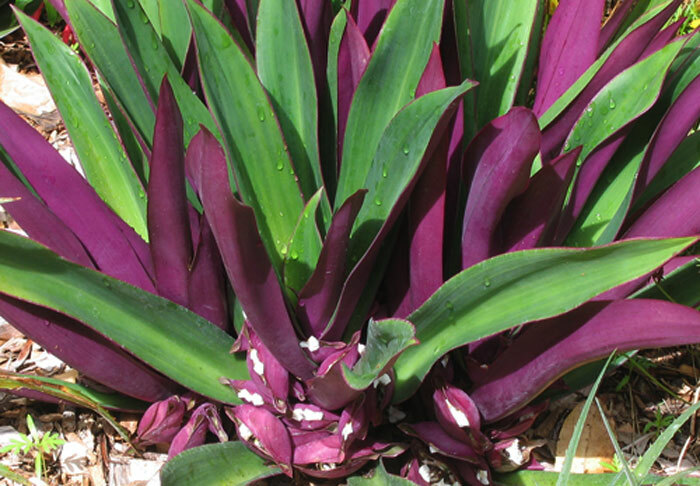 Planting and Care: This is one of those hot climate loving plants that will not withstand cold weather. 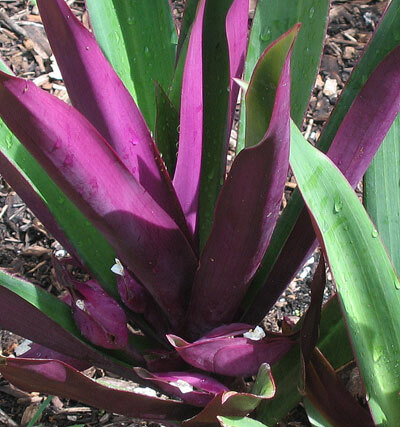 It likes full hot tropical sun, fertile well drained soil and a relatively humid environment to be at its happiest. This is a very appealing tree appearing much like a weeping willow, but with the added attraction of having long lasting flowers. Photographed: Below on the left in the Botanical Garden in Naples, Italy, and below in the middle and on the right at the Hotel Regis in Panajachel, Guatemala. Planting and Care: It will do well in full sun or semi shade as we have seen it thriving in each setting. I would describe this as a small tree rather than a shrub so I may have gotten the identification wrong. The flowers are exquisite and have been on the trees now for four months. 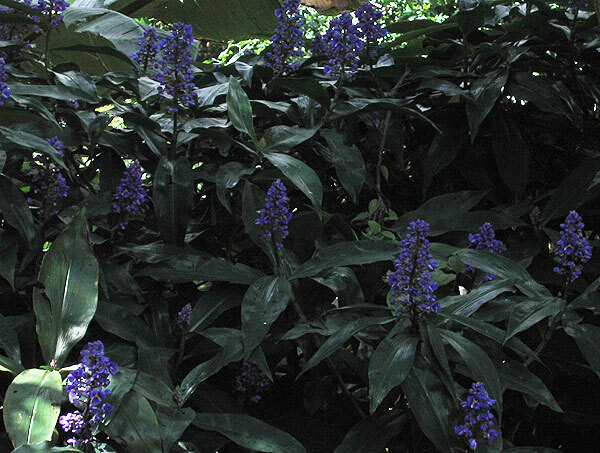 Benefits: Aside from its exuberant growth and lovely flowers, this plant attracts butterflies and hummingbirds to the garden. Planting and Care: This pink flowering shrub will grow to be quite tall at its best if planted in a bright semi shady area. 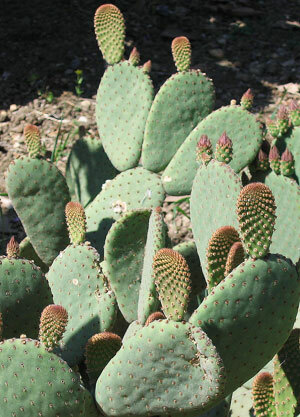 It likes rich soil and routine rainfall or watering. Benefits: This is an attractant for butterflies and hummingbirds. Planting and Care: This tall red flowering shrub will grow to be 10 to 15 feet tall at its best if planted in full sun or in a bright semi shady area. 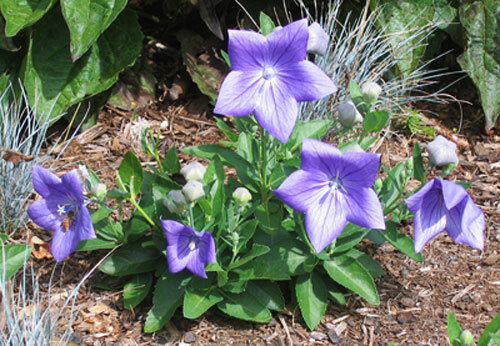 It likes rich soil and routine rainfall or watering and an acid soil. It's wise to prune the flowers on top as a way of keeping the plant under control as well as being a way to encourage more blooms. Benefits: It is appealing not only to us, butterflies and hummingbirds also can't resist its charms. 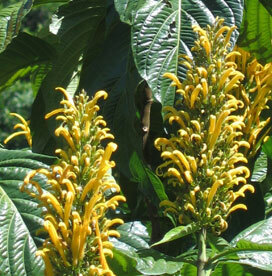 Planting and Care: This yellow flowering shrub will grow to over ten feet tall if planted in a bright semi shady area. It likes rich soil and routine rainfall or watering. I've read that it will grow to as much as 8 feet tall, but I've seen it growing much taller. 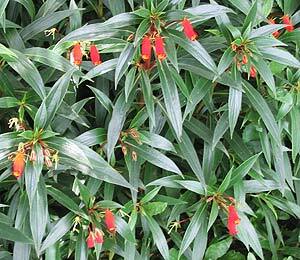 This very easy to grow small warm climate plant will delight you with its ease of care and with its appeal as you can see in the photograph. Its low growing nature makes it a perfect ground cover. Photographed: In the Royal Botanic Garden in Sydney Australia in 2013. 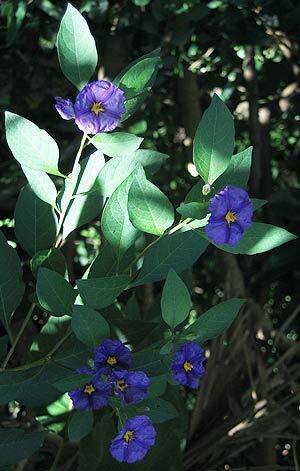 Planting and Care: Ruellia likes to grow in bright shady areas with routine rainfall or watering. The breadfruit tree is very attractive as a tree even if it never produces fruit, but it does. Its fruits can weigh up to 10 pounds each and in the tropics they are cooked and eaten in a variety of ways much like white potatoes – boiling, roasting or frying. Benefits: Breadfruits are high in carbohydrates and vitamins A, B, and C. Even more importantly, the leaves may be made into a tea to reduce high blood pressure. 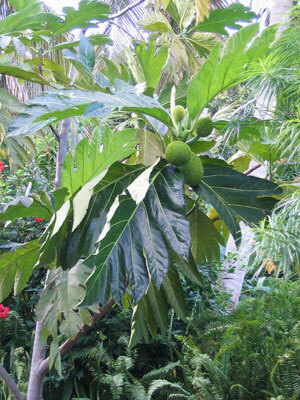 From: The breadfruit was brought to the West Indies in 1793 from Tahiti. Photographed: In Moorea, French Polynesia in 2013. 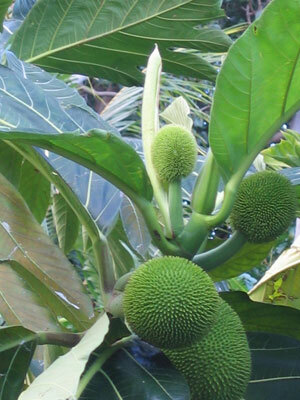 Planting and Growth: Fast growing to 50 or 60 feet, the breadfruit likes life sunny and moist. Like so many tropical trees it is very susceptible to dry wood termites. I love broccoli and all of the recipes I have for making it an every day or so major ingredient in one of our meals. Still, I remember growing it in Rhode Island and know that it is vulnerable to more insects than some other vegetables that I also grew. That makes me very leery of any broccoli that is not organically grown or grown in my own garden. Benefits: Wonderfully low in calories and great tasting broccoli provides us with yet more wonders in that it is high in fiber, vitamins and minerals. As well, it is now touted as one of the recent "super foods" for its "...antioxidants that may improve your odds of breast cancer survival and reduce the risk of colon cancer." Broccoli sprouts may have even more potential as cancer fighters according to researchers at Johns Hopkins University. These sprouts taste great, so you can enjoy your sprout enhanced sandwich and maybe be a little more protected from ever increasing cancers. As if that were not enough, broccoli is loaded with Vitamin C.
I am actually a lover of Brussels sprouts and have been sad that they are not general available at the market here at Lake Atitlan. I think the mistake most folks make with them is cooking them too long, the same problem they have with cabbage. Brussels sprouts are low in calories and delicious cooked al dente, well drained and dotted with lots of the freshest butter you can find and freshly grated black pepper. Benefits: According to Yahoo News, "The smell is a compound called allyl isothiocyanate that causes pre cancerous cells to self-destruct," Jonny Bowden, PhD, author of 'The 150 Healthiest Foods on Earth' says. "It's entirely possible that eating them every few weeks could help greatly reduce the incidence of colon cancer." As with broccoli, Brussels sprouts are vulnerable to some unappealing insects. Always try to buy them organically grown. Planting and Care: I grew Brussels sprouts in my garden in New England years ago and remember them being a fairly long season crop with the advantage that you could walk out in the snow and pick some for dinner. They were at times plagued with aphids and I did use the very effective rotenone which was considered organic at the time. I don't know if it is today as we have lived outside of the US for many years. I thought you might enjoy seeing this weird fruit as much as we did so here it is. It may be the first cultivated citron. 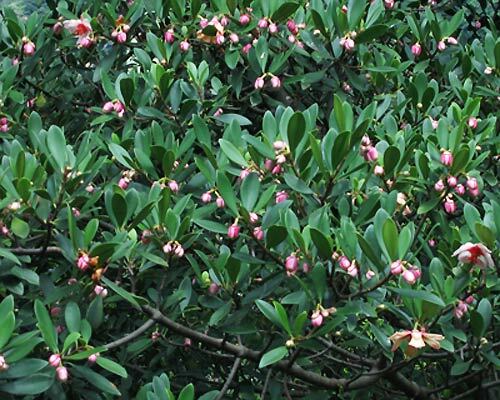 Benefits: It is said to have medicinal benefits. 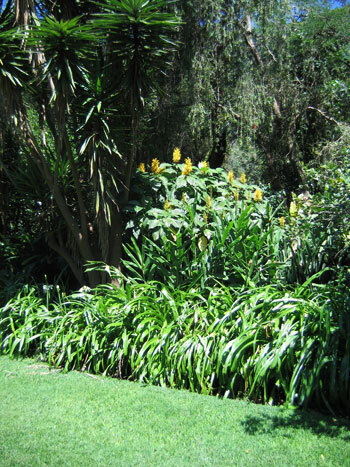 Photographed: In the Winter Garden in Auckland, New Zealand. Planting and Care: With this one you're on your own. 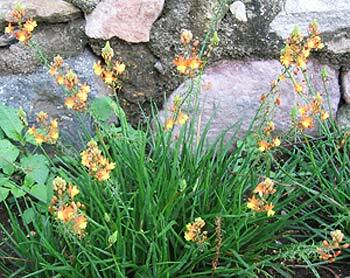 Bulbine is a very hardy plant with flowering stems growing to about one foot in height. 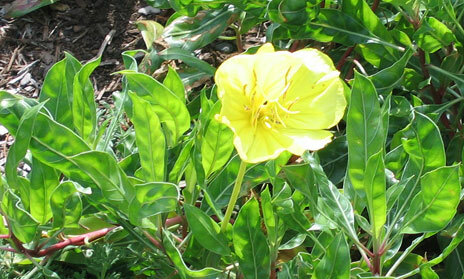 Normally the continually blooming flowers are a combination of yellow and orange as in the photograph, but there are also less common varieties with only yellow flowers. Photographed: By the side of the road at the beach in Panajachel, Guatemala. Planting and Care: This pretty plant is almost immune to insects and diseases and grows in full sun with very occasional rainfall or watering. This is a large very appealing cactus that will grow to be 12 feet tall if it's happy and end up being about 5 feet across. Planting and Care: Bunny ears will grow in full sun or bright partial shade in well drained soil that is moistened only when completely dry. They will handle temperatures to 40 degrees F., but best not to test their resolve. This is a very tall growing and very long living pine (500 years) that first caught my eye in the Recoleta Cemetery in Buenos Aires. It is stunning and majestic. The second time I saw it was in the splendid Botanical Garden in Naples, Italy. 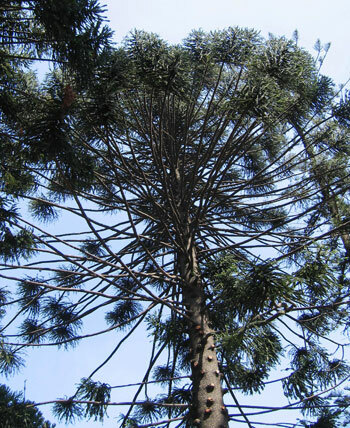 The Bunya Pine was growing just fine when dinosaurs walked the planet. It is now rarely found outside of protected environments like that in Naples. My photographs just don't do it justice. Benefits: Its pinecones were once widely collected and eaten by Indigenous peoples. "Green" folks in Australia have now invented all sorts of stylish recipes for the cones. Photographed: On the right in the Naples, Italy, Botanical Garden and on the left in Buenos Aires, Argentina. Text and Photographs ©GreenGardeningCookingCuring.com 2012. If not for its luscious yellow flowers, I would consider this a weed tree; something to be removed so that something better could take its place. 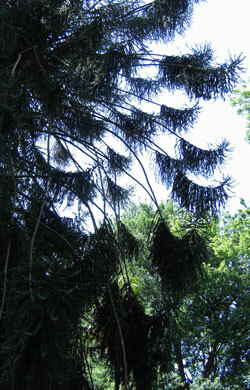 Planting and Care: This is a very soft wooded tree that will grow to about thirty scraggly feet if left on its own. It's appearance is much improved if it is heavily pruned after blooming. 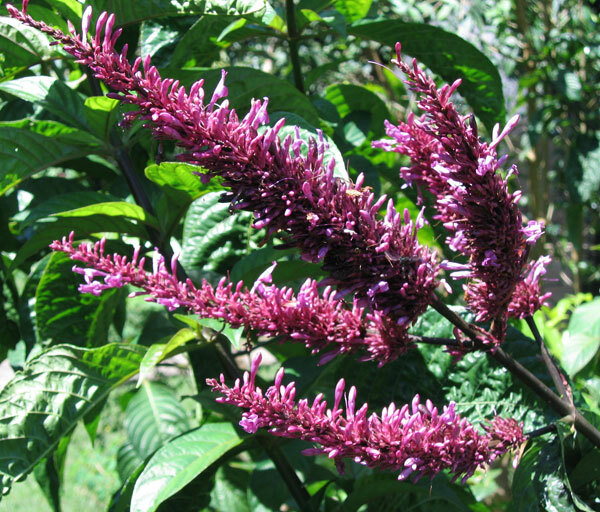 Benefits: As is probably evident from the name, butterflies and hummingbirds like the flowers on this easy to grow plant. Planting and Care: This relatively small bush has lovely flowers which are produced over several months. Plant it in full sun or in a semi shady area. It will be quite hardy once it has settled in; it will live through dry periods, but not very well if it is subjected to very wet periods.It is not too fussy about its soil and is tolerant of a full range on the pH scale. This is an appealing perennial plant I first photographed in 2013, only later finding out what it was when a visitor to the site filled me in. Beginning in June it flowers all summer long with bright orange flowers and added touches of yellow. In autumn I found its similarity to milk weed very appealing. 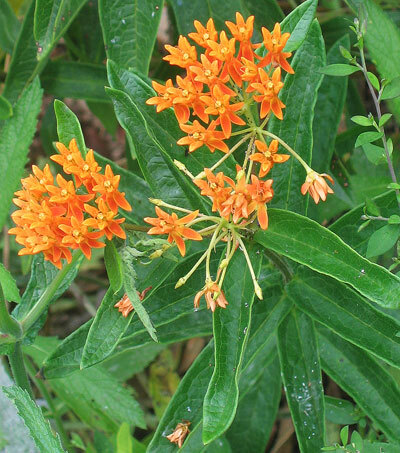 Butterfly weed will grow to be about two feet tall and with its pleasing blossoms and ease of care it gets high marks. Benefits: Chewing the roots of this plant was said by American Indians to improve lung ailments like pleurisy, hence its second common name. From: The USA from north to south. 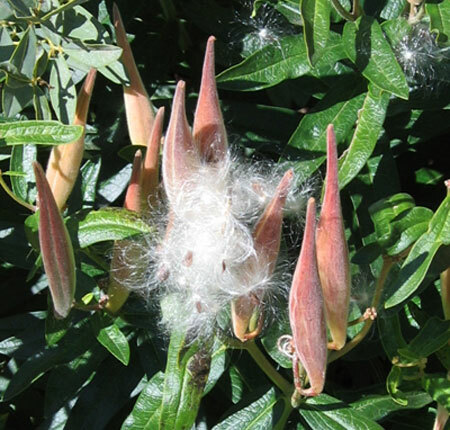 Planting and Care: Butterfly weed is a butterfly attractant as you would imagine and it grows happily in cold climates. It is also accepting of rather tough planting situations being satisfied with little but full sun and relatively dry poor soils. This is a hardy plant once established. Seeds should be sown where the plants will live as they do not transplant easily. Photographed: In the Blithewold Garden in Bristol, Rhode Island 2017.